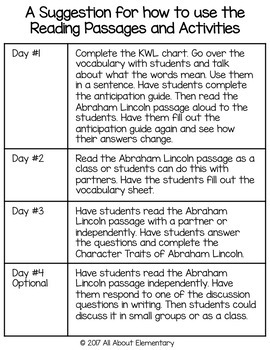 This is a four day unit on Abraham Lincoln. It includes two reading passages (they are the same, one is slightly easier), vocabulary pages, vocabulary cards, KWL chart, anticipation guide, text dependent questions, discussion questions, writing paper, and a coloring page. 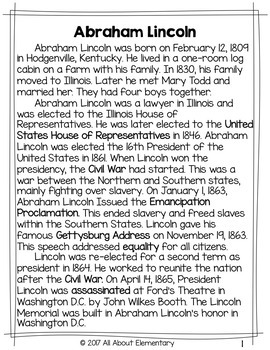 There is a lot of important vocabulary in the passages that might be hard for third and fourth but it can be scaffolded through the vocabulary cards and activities. 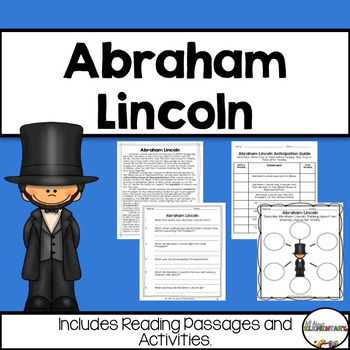 This is a great way to learn about Abraham Lincoln! Check out my presidents' day bundle!